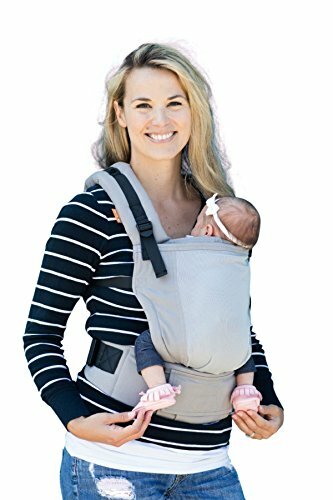 Transition into parenting easily with the Baby Tula Free-to-Grow Coast Mesh Carrier, the best, easy-to-use, stylish carrier that comfortably carries your baby from 7 to 45 pounds without an infant insert. Enjoy multiple ergonomic carry positions with an adaptable panel that adjusts in width and height to fit your baby at any stage, and fully adjustable shoulder straps and waistband for optimal comfort for you. • The Best, from the Start: The Free-to-Grow Baby Carrier welcomes baby from the womb, by mimicking their natural shape and size. • Grows with Baby: An innovative adjustable mesh panel has multiple height and width settings easily customized to fit to your baby: from newborn, infant, and early toddlerhood. • Multiple Ergonomic Positions: 9 sizing and carry combinations ensure that your baby is carried in a natural, ergonomic position that promotes healthy hip and spine development and feels comfortable for long-term wearing. • User Friendly and Fits Your Size: No fuss design that is easily adjustable to fit many body types so, you and baby can move as one! Simple steps to get the carrier on and off quickly. • All You'll Need: No infant insert needed. A weight range from 7 - 45 pounds will support your baby from the beginning and far beyond. • Show off Your Style: Unique, stylish prints that let you continue to express your personal style as you transition into parenthood. Join the many families who have found the ultimate baby carrier that doesn't overcomplicate quality, comfort, and style. Find your fit, choose your style, and keep on doing what you love with the only carrier you'll ever need: Baby Tula.